Previous knowledge required; Need to know how to handle a screwdriver. 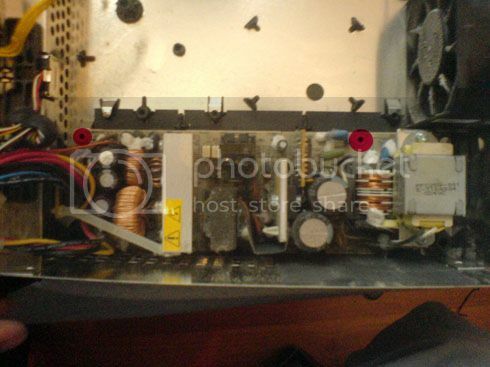 A word of warning before you start; be very careful when handling the insides of an Xbox. For some reason, the motherboard and PSU are more delicate than that of a normal PC. Also, the metal casing inside can be sharp in some areas. I will not be held responsible for any hospital bills as a result of this mod. Please note that this tutorial is based on what I have done and how I have done it. I will not be held responsible if you decide to do the mod and your Xbox breaks, k? =) Also, this mod will, obviously, void the warranty on the Xbox, so either wait for the warranty to run out, as I did, or lose the warranty to perform this mod. Okay, so, the first thing you need to do is turn the Xbox upside down. There are 6 screws on the underside of the Xbox that need to be taken out. 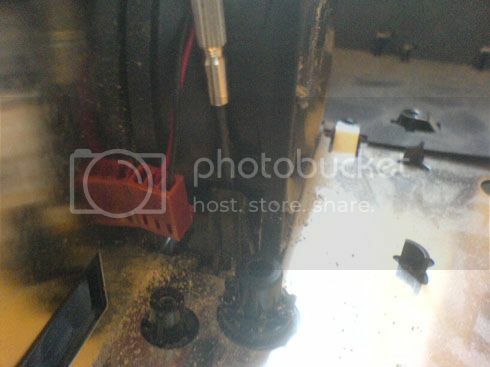 The following picture shows where the screws are located. Once the screws have been taken out, flip the Xbox around again so it’s right way up, and slowly lift the casing off. Once you have done that, you should be left with the following. 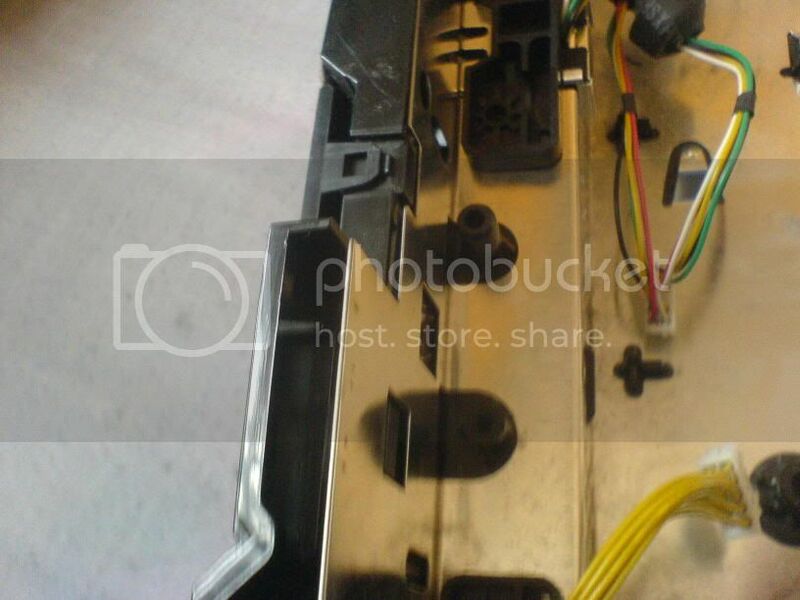 The above diagram also shows where the screws for the HD and DVD drive cages are located. Using a screwdriver (duh), unscrew the screws keeping the cages in place. Once you have done that, the DVD drive and it’s cage should come out nicely. Lift the DVD drive and unplug the power cable and IDE cable attached to it. The HD, on the other hand, is a little more awkward. The HD will move out, but the 4-pin power cable is plugged in more tightly on the HD than the DVD drive. Lift the HD cage carefully, and move it out of the Xbox. The power lead is still connected, so be careful not to break it. The HD can be easily detached from it’s cage. Do so by unscrewing the 2 screws either side of the cage. The diagram above shows what’s underneath the HD cage. The lead labelled ‘1’ is the 12-pin power cable coming from the PSU. Unplugging this shouldn’t be a problem. 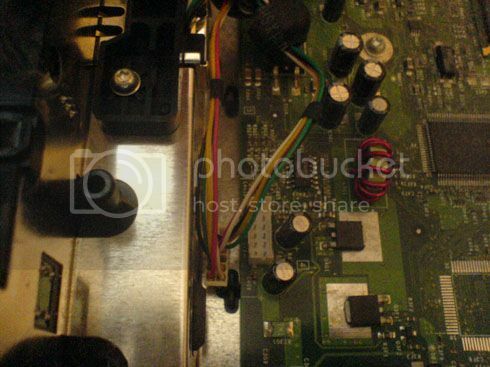 ‘2’ is the power cable coming from the power and reset board on the front of the Xbox. This cable is very delicate, so be VERY careful not to break it. I cannot stress enough how important it is to not break this wire. If you do, your Xbox is ruined, unless you can find a replacement for it. Okay, so once you have done that, move the cables out of the way, unplug anything else that may be plugged in the motherboard (fans, controller ports)and unscrew the motherboard. 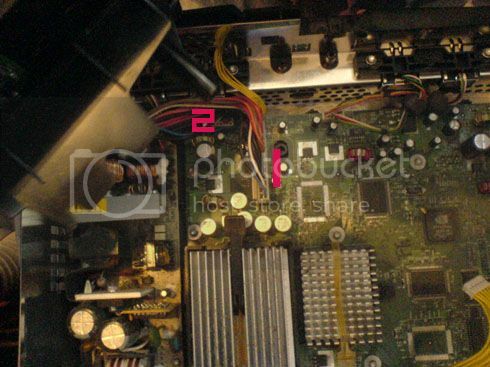 The picture below shows where the 8 motherboard screws are located. Unscrewing this is relatively straightforward. Once the motherboard has been unscrewed, gently move it out. Move the motherboard towards the front of the Xbox, then lift it out. You should be left with the PSU, fan and controller ports. Now, the PSU. In a sentence, it’s pretty damn heavy. Unscrewing this, again, is a piece of cake. 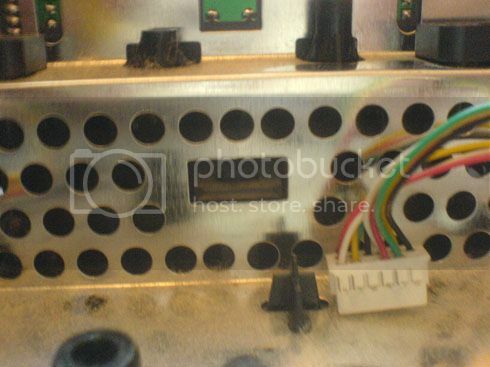 The picture below shows where the PSU screws are located. 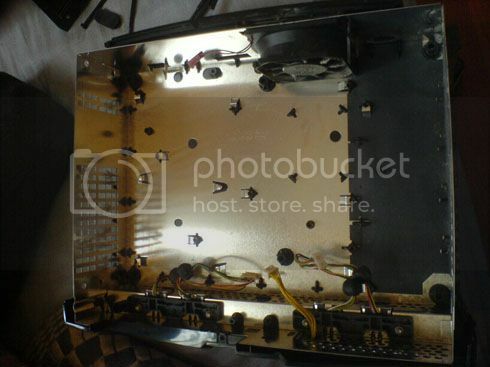 Unscrew this, and lift the PSU out. Move it towards the front of the case, and then lift it slowly. Simple, right? Okay, so finally, the controller ports, power/reset board and fans. They may seem simple to take out, but they actually require a bit of effort. Okay, first, the fan. 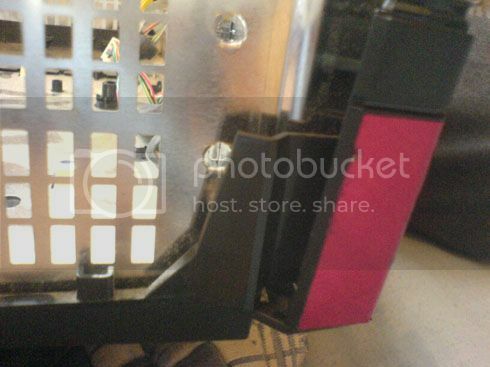 The fan is clipped into the metal casing, so force is required to take it out. 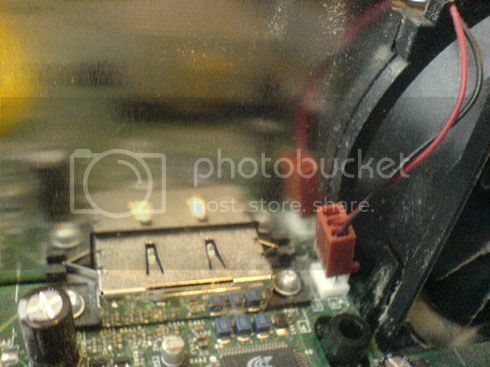 Personally, I think it’d be better if you changed the fan when you put it in the PC case, but that’s just me. 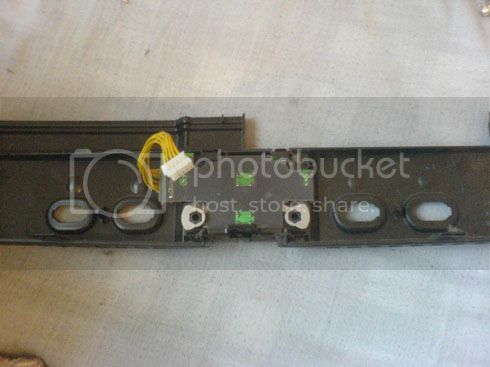 As you can see from the diagram above, the fan is clipped into place. I used a small screwdriver-thing to wedge the clip and move the fan out. The same clip is on the opposite side. So, my advice is, use some sort of leverage to move the clips away from the fan and lift the fan out. It’s not too difficult. Last edited by raphael2040; 7th June, 2006 at 01:03 PM. 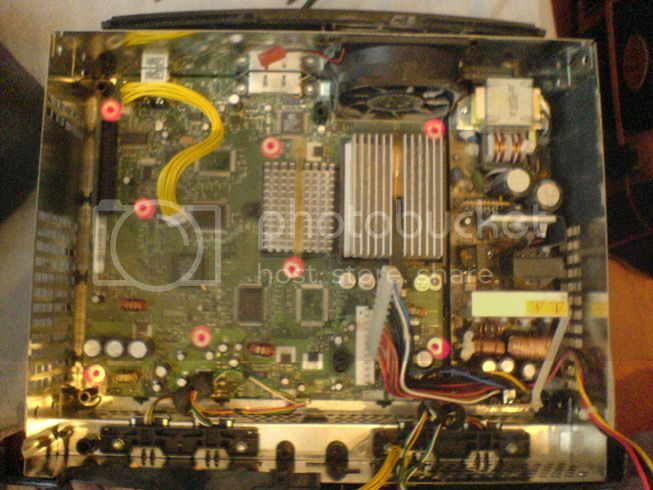 Now, the power/reset board on the front of the Xbox is THE MOST DELICATE AND IMPORTANT part of the Xbox. Unclip the front bezel. Once this is done, refer to the picture below and unclip the bezel by unclipping the sides of the bezel, and using a bit of force, pull it off. The front should come off nicely. You should be left with this. Back to the Xbox. 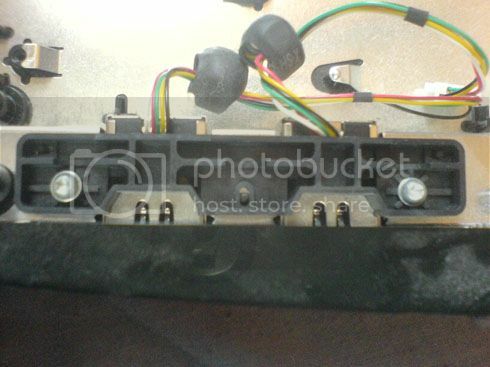 The final part to take out is the controller ports. These controller ports are nothing but USB ports, as evident by the connection on the motherboard. As with the fan, the controller ports are clipped in place. 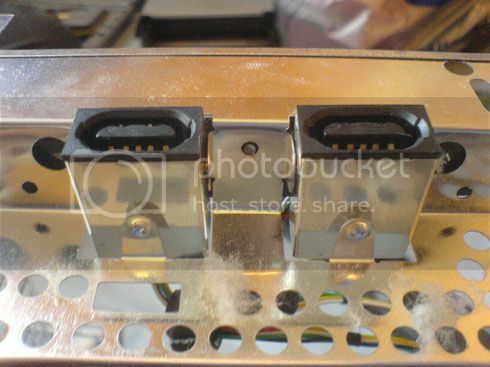 There are 2 screws that need to be taken out before you start yanking at the ports, however. The picture below shows where they are. Each pair of controller ports have these screws screwed into them. Unscrew then, and you should be left with something like this. Unclipping it is relatively straightforward. Simply move the clips either side of the controller ports, and push the controller ports out. And that’s it! Dismantling an Xbox is that easy! Hope you find this tutorial useful! I will be writing the second part of it, the actual ‘putting into a PC case’ part on Friday. -	Please note that the first two images were taken from http://www.xbox100.com/tutorials/tainted/paintbox.html. Great work, and really good pics aswell 10/10. Well done! Show us some final images soon! Yay, thanks for the comments everyone. Actually, I'm planning on building a Media PC for the new house and I have an Xbox. I think I might do fiddlingly and see if I can combine the two. I'm dabbing with Mini ITX for the the actual PC, so I should have alot of room, although some work would be needed. Whatever happens, I wanna see pix! That would be cool. The Xbox Motherboard doesn't take up that much room anyway. It looks to be MicroATX, but I could be mistaken. A GREAT MOD beautifully presented! Wonderful work raphael2040! Just fitting it into the Xbox as we speak.